This past week has been a tough one for the third base position. Ryan Zimmerman underwent abdominal surgery and will be out up to another six weeks. Pablo Sandoval will miss at least that much time with a broken hamate bone. David Freese also broke his hand. Scott Rolen is having shoulder issues. Ian Stewart was sent down to the minor leagues. Pedro Alvarez is struggling with the whiff. If you have multiple teams, odds are you are looking for a third baseman in at least one league. We’ll break down some options here, tiered by league depth, so that you can sort through the mess. It’s hard to know exactly which players are available on your waiver wire, but chances are, if you’re in a ten-teamer, Chase Headley is out there for you. Ideally, you’d like to play him against righties and away from home – so if you can platoon him in this manner, go ahead. As a batter, Headley has made some strides. He’s showing the best walk rate of his career and his power is up from last year. He has a lifetime BABIP of .330, so it wouldn’t be surprising to see him get a little luckier on balls in play despite owning a current .301 BABIP. By the end of the year, Headley should be hitting around .260 with double digit home runs and steals, so he’s a decent stop-gap player. Of course, if you are lucky enough to find Chipper Jones on your waiver, he’s a much better option. But Headley’s no bum. Finally, the best option is probably Jed Lowrie, who made his fifth start (eighth game) at the position on Tuesday night. If he’s available and eligible, he’s your man. Edwin Encarnacion is doing everything he’s always done in terms of his plate discipline and hit trajectory stats, but the power hasn’t been there. It’s a little much to ask him to recover his power so soon after a wrist injury, but that might be what you are stuck with. If power is your sole goal, you may want to go with Ian Stewart, who is now back in the major leagues. In interviews he has practically demanded that he play every day. If the team allows him that – it’s not like Jose Lopez is a better option (with his 1 OPS+! ), and Ty Wigginton is also a flawed player – he could go back to striking out a little less than a third of the time, which would probably result in an Encarnacion-ish .250 batting average with power. If every hit counts, Danny Valencia has had bad luck so far this season and should at least be able to hit .265 or so going forward. In these leagues, you’re mostly just screwed. In my 11-team AL-only, the best waiver option is either Omar Vizquel or Matt Tolbert. I’d take Tolbert, mostly just because he’s playing often because of the current state of the Twins infield. If Andy LaRoche is available in your league, he’s been seeing more time for the Athletics and has been acquitting himself well. On the NL side, Mike Fontenot is getting more playing time at shortstop and, because of his position eligiblity, actually create some trade value for himself by stealing the starting shorstop role in San Francisco while your third baseman is out. That’s how bad Miguel Tejada has been this year. Over with the Reds, Daniel Descalso is probably the man taking over for Freese right now, but watch Allen Craig if he’s available, as he’s the best bat in this paragraph – but he’ll have to build up eligibility at the positon, most likely. Third base is hurting right now, literally and figuratively. Hopefully some of these free agent options will help you survived until you get your third baseman back. For more check out Bloomberg Sports’ Front Office 2011. With Chipper Jones slated to miss the rest of the season, the big question is how fantasy owners and the Atlanta Braves can replace the future Hall of Famer. Let’s begin with Atlanta. Jones’ injury further complicates an infield depth chart already stretched thin by Martin Prado’s presence on the disabled list since early August. All-Star reserve Omar Infante’s attention is focused on replacing Prado, leaving Brooks Conrad at third base. The 30-year-old has an interesting back story. A former eighth-round pick of the Houston Astros, Conrad made his major league debut with the Oakland Athletics in 2008 after qualifying for minor league free agency. 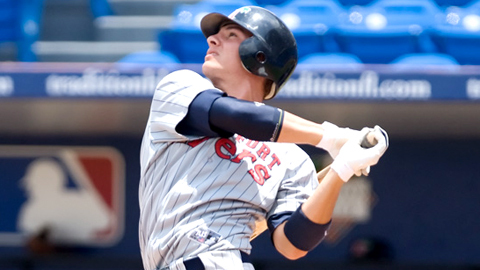 He joined the Braves’ system before the 2009 season. In 128 plate appearances this season he’s hit .241/.315/.500, including a memorable grand slam to complete a comeback against the Cincinnati Reds. The Astros’ shining star this season, 25 year old Johnson is hitting .360 with 34 RBI in just 190 plate appearances. He’s owned in only 83% of ESPN leagues, suggesting he might be available in yours. It’s unreasonable to expect this level of performance to continue, as Johnson’s BABIP is well over .400, and his minor performance over five seasons was a mediocre .277/.315/.429. That’s probably closer to reality than his 2010 to date, but it is worth noting that Johnson was hitting .329/.362/.570 in Triple-A this season before getting the call. Minnesota’s newest attempt at finding a solid hot corner holder since the Corey Koskie days is hitting .329 with a .375 on-base percentage. He’s owned in only 3% of ESPN leagues, yet over the last 30 days. Valencia is hitting .322/.361/.444, which dwarfs Evan Longoria’s .235/.336/.382 and Michael Young’s .257/.314/.477 offerings. That’s not to say Valencia is on their level, just that his performance over the last 30 days should have incited at least some interest. Valencia is the better option if all things are equal, but Johnson playing in the weakest pitching division in the league should be given some thought too. If you’re looking for power rather than batting average help, Conrad’s your best bet.